This is a game system unlike any you've played before. In this booklet are the rules you need to create a character core. With that character core, you can create any number of player characters for any number of game universes within the Amazing Engine game system. You can create wizards, mercenaries, alien technologists, xenoform thieves - any kind of character, from nearly any kind of fantasy or science fiction setting, is possible with these rules and the appropriate Universe Book. This System Guide also explains the rudiments of combat (how does my character hit things?) and skills (what does my character know?). Plentiful examples take you step by step through the character generation process, and illustrate the concepts behind this system's skill uses. These rules are designed to be used in conjunction with the Universe Books. 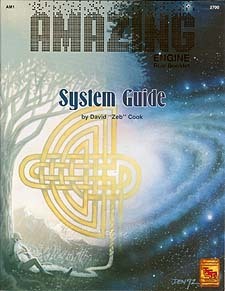 You must have both this booklet and a Universe Book in order to play within the Amazing Engine game system.